Camille Pissaro – private collection. Title: Avenue de l’Opéra: Morning Sunshine. Date: 1898. Materials: oil on canvas. Dimensions: 66 x 81.9 cm. Source: https://www.flickr.com/photos/47934977@N03/44457387982/in/feed. I have changed the light and contrast of the original photo. 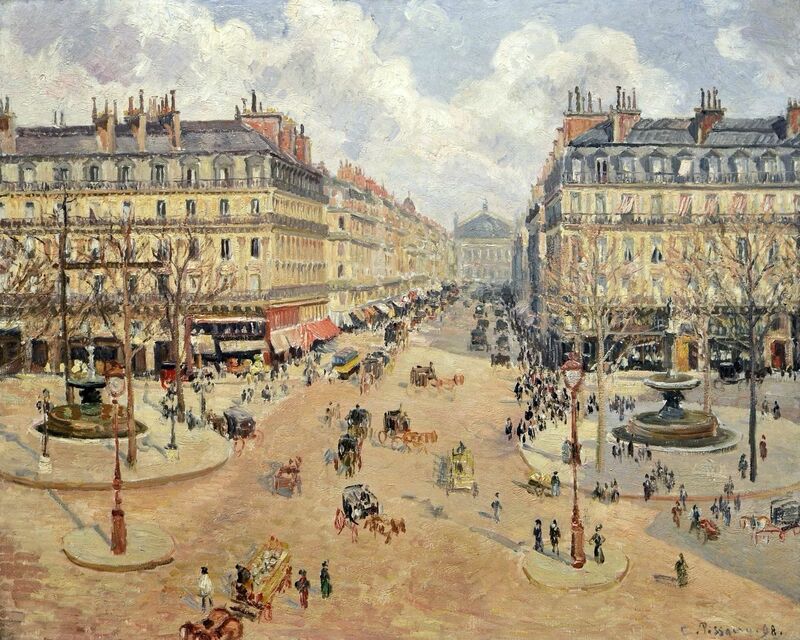 Camille Pissaro – The National Galleryof Art 1970.17.55. Title: Place du Carrousel, Paris. Date: 1900. Materials: oil on canvas. Dimensions: 54.9 x 65.4 cm. Nr. : 1970.17.55. Source: https://commons.wikimedia.org/wiki/File:Place_du_Carrousel,_Paris.jpg. I have changed the light and contrast of the original photo. 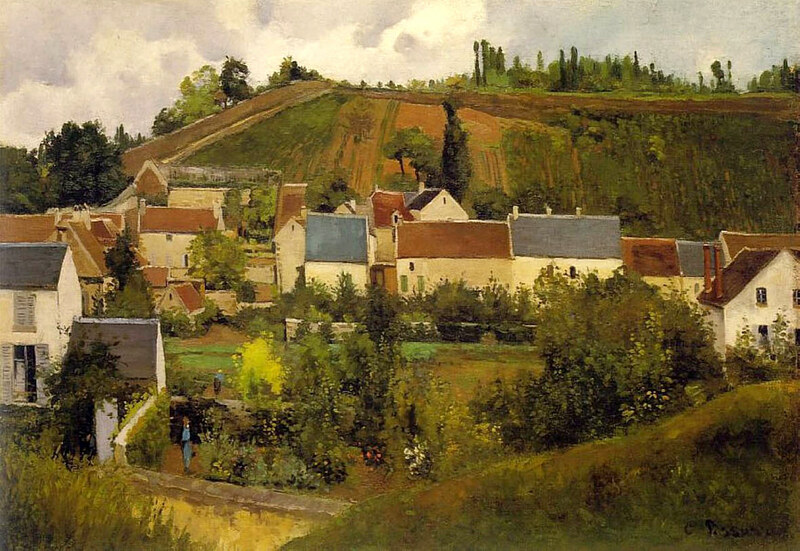 Camille Pissaro – Fondation Rau pour le Tiers Monde. 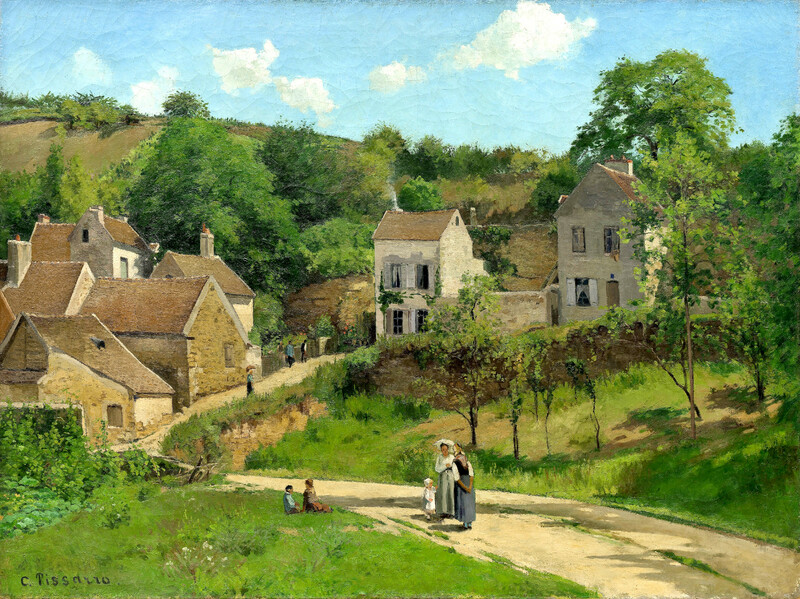 Title: Vue de l’Hermitage, Côte de Jallais, Pontoise. Date: c. 1867. Materials: oil on canvas. Dimensions: 70 x 100 cm. Source: https://thearkofgrace.com/wp-content/uploads/2013/03/Vue-de-lHermitage-C%C3%B4te-de-Jallais-Pontoise-c.-1867.jpg. I have changed the light and contrast of the original photo. 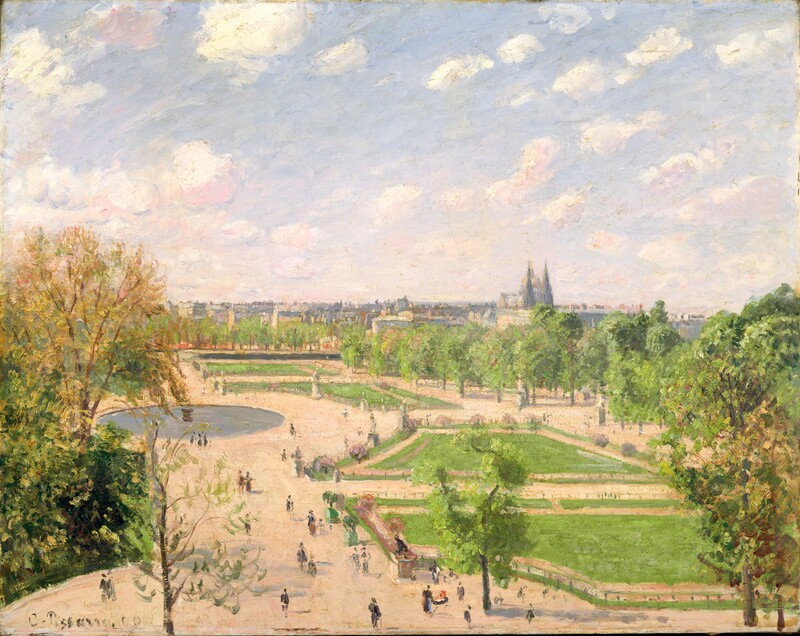 Camille Pissaro – The Nelson-Atkins Museum of Art. Title: Rue Saint-Honoré, Sun Effect, Afternoon/La rue Saint-Honoré: effet de soleil, après-midi. Date: 1898. Materials: oil on canvas. Dimensions: 65.4 x 54.6 cm. 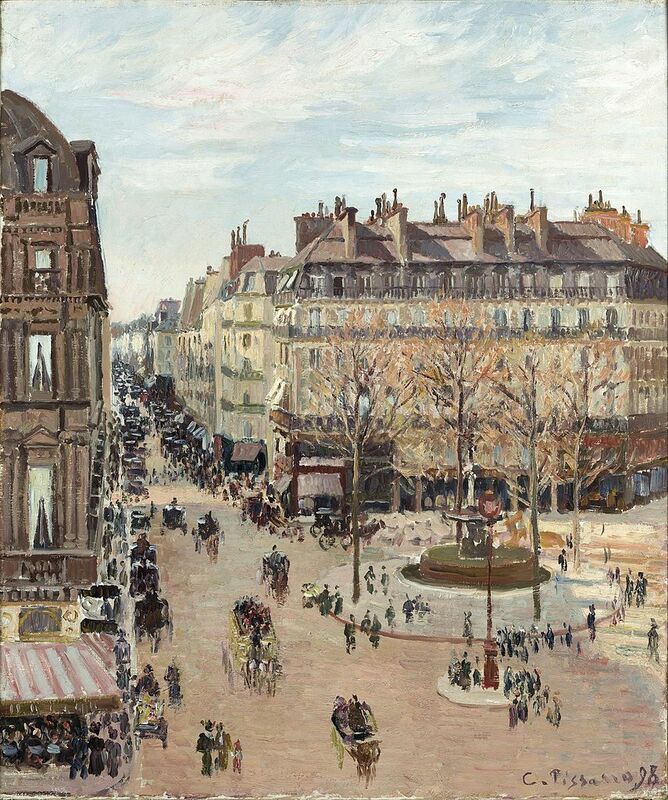 Source: https://commons.wikimedia.org/wiki/File:Camille_Pissarro_-_La_rue_Saint-Honor%C3%A9_(1898).jpg. I have changed the light and contrast of the original photo. Camille Pissaro – private collection. Title: Le Printemps. Date: 1872. Materials: oil on canvas. Dimensions: 55 x 130 cm. Source: https://www.flickr.com/photos/47934977@N03/16715312148/sizes/l. I have changed the light and contrast of the original photo. Camille Pissaro – The Van Gogh Museum s0512S2006. 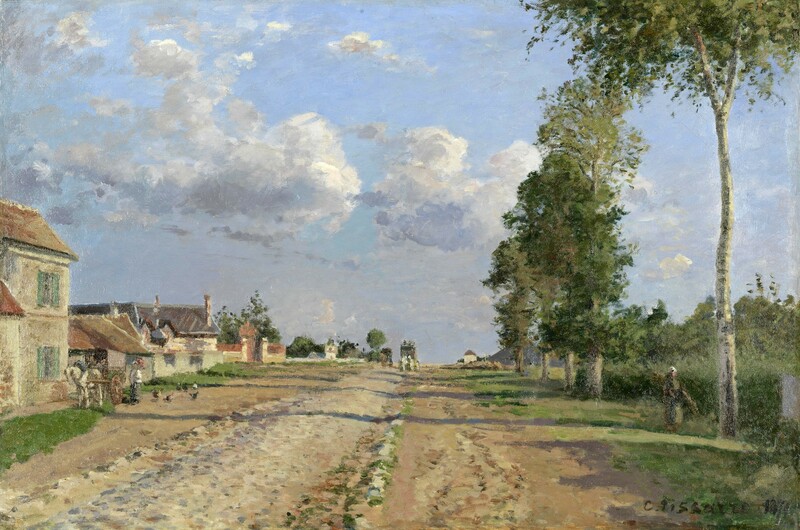 Title: Route de Versailles, Rocquencourt. Date: 1871. Materials: oil on canvas. Dimensions: 51.5 x 76.7 cm. Inscriptions: C. Pissarro. Nr. : s0512S2006. Source https://www.vangoghmuseum.nl/en/collection/s0512S2006. I have changed the contrast of the original photo. 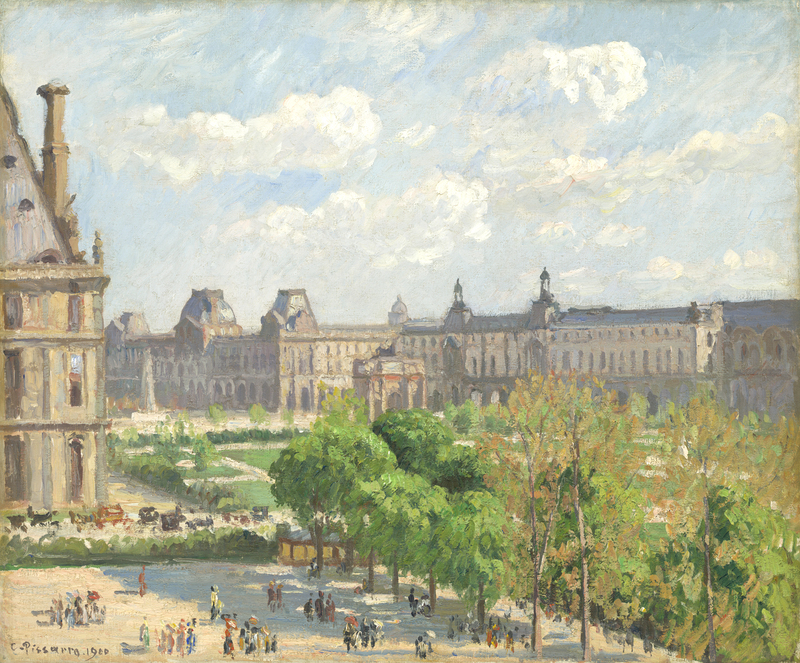 Camille Pissaro – The Hermitage Museum ГЭ-9002. 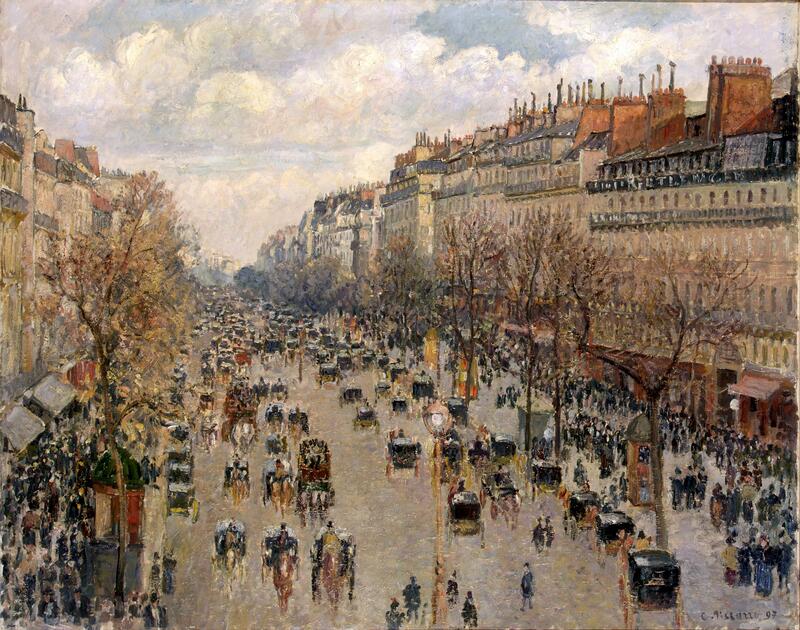 Title: Boulevard Montmartre in Paris. Date: 1897. Materials: oil on canvas. Dimensions: 74 x 92.8 cm. Nr. : ГЭ-9002. Source: http://www.hermitagemuseum.org/wps/portal/hermitage/digital-collection/01.+Paintings/28682/?lng=en. I have changed the light, contrast and colors of the original photo. Materials: oil on canvas. Dimensions: 48 x 73 cm. Acquisition date: 1984. Nr. : NG6493. 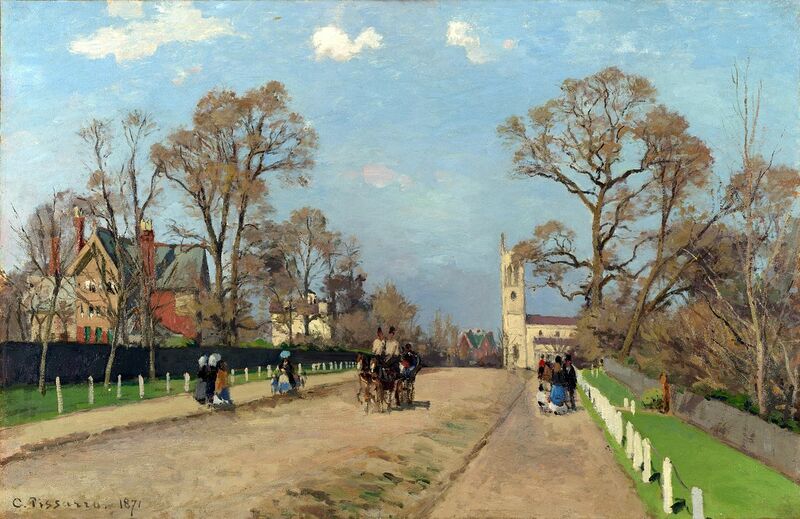 Source: http://commons.wikimedia.org/wiki/File:Camille_Pissarro_-_The_Avenue,_Sydenham_(1871).jpg.